Thank you for your donation to Soul Choice Ministries! We make a difference by working together. The purpose and heart of Soul Choice Ministries is to reach the lost and strengthen believers everywhere. We continue to share the message of 23 Minutes in Hell through meetings, conferences, TV and radio interviews, video, printed and audio resources, and social media. This would not be possible without your prayers and faithful giving. 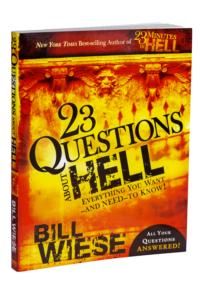 In thanks for your donation, you will receive a FREE copy of the book, 23 Questions About Hell. We want you to be equipped to answer the tough questions people ask about this important topic. Your gift enables us to further the message of 23 Minutes in Hell, reaching the lost with the truth about hell and eternity. We are making an eternal difference for the Kingdom because of generous supporters like you! We strive to steward your gift well, so thank you for your trust and support. Choose your gift amount today. YES! Send me my free book! Soul Choice Ministries is a 501(3) organization. Your donation is tax-deductible.